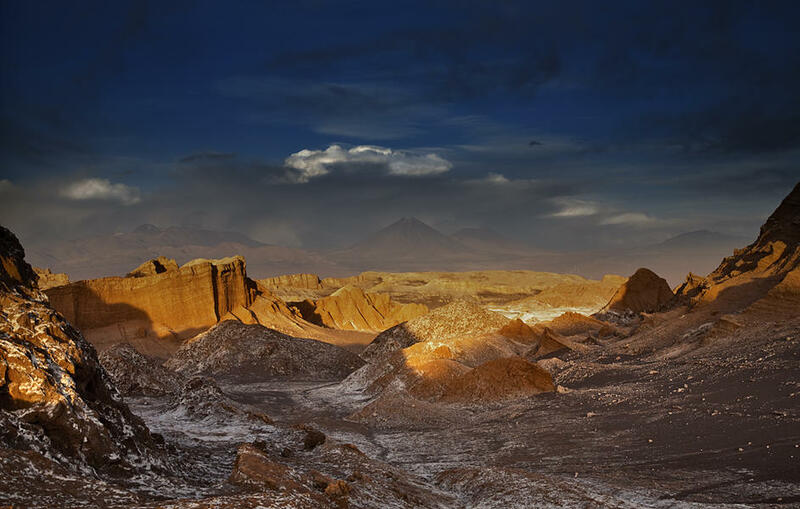 As with any landscape, the desert reveals its inherent beauty under the right light. Desert locations can be made and unmade by the contrasts of light and shadow, so you’ll want to shoot when the sun is low in the sky. This will throw plenty of shadows into the scene and reveal the beautiful contours of the dunes, giving your image a three-dimensional feel. 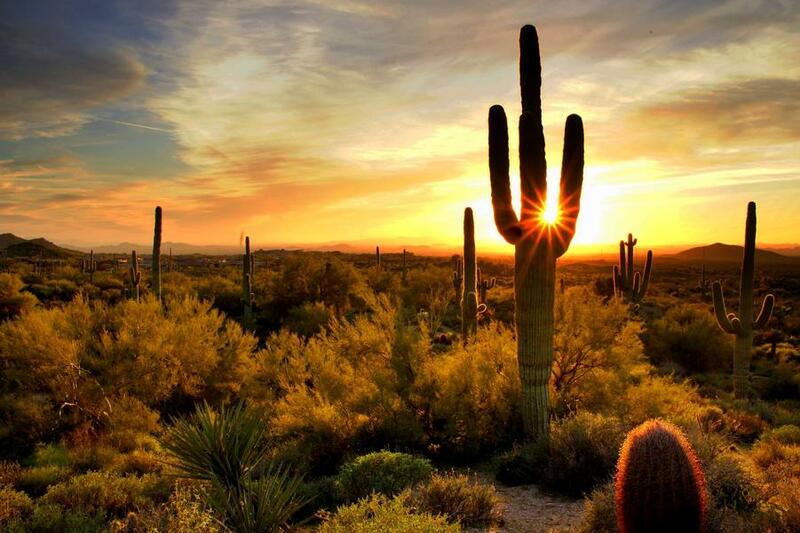 Try and avoid shooting the desert during the middle of the day, as the high sun will flatten the scene. Landscape photographers often talk about shooting in the golden hour, which is the time just after sunrise and before sunset. 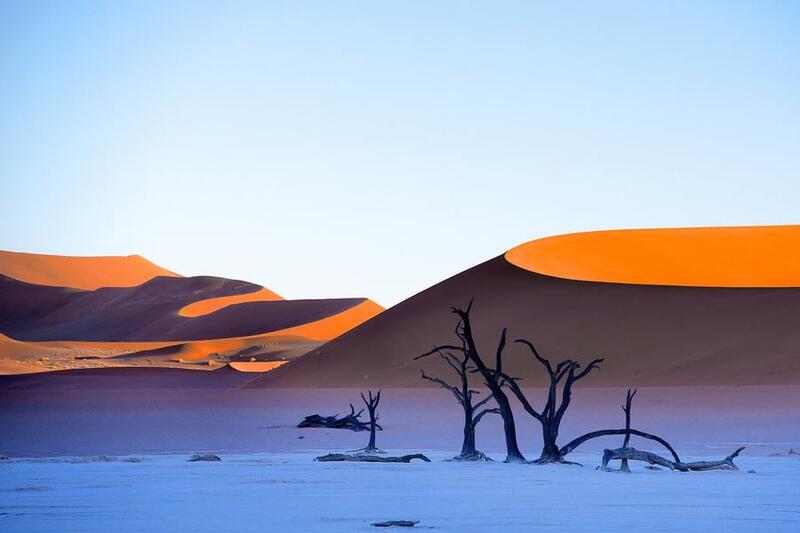 Shooting during the golden hour reveals the stunning colour of the desert. At this time of day the desert looks almost like a Martian landscape due to the stunning red and orange glow of the sand. A helpful accessory when shooting deserts is a polarising filter. 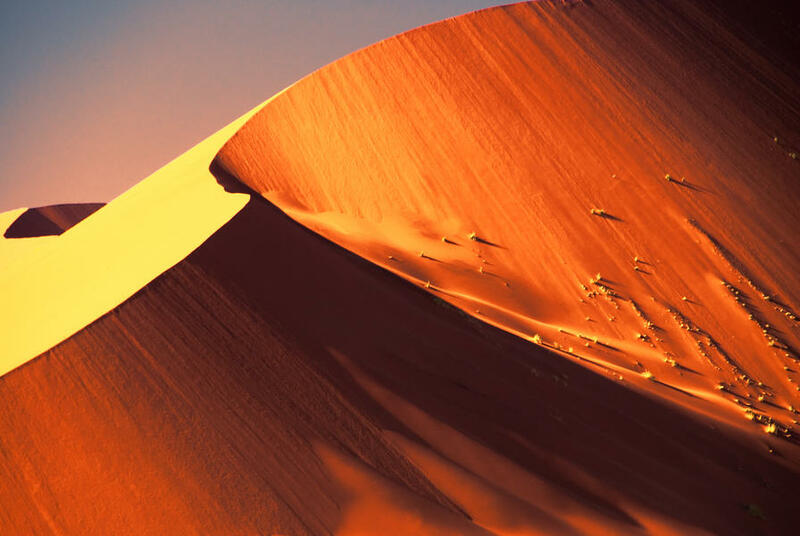 Deserts are generally complimented by vast expanses of clear sky and the polarising filter will help to bring out the rich blue of cloudless skies. Sand can also suffer from the same aesthetic issue we find when shooting grass and leaves – it reflects the light of the sun. Attaching a polarising filter to your lens will help to reduce the glare from the sand, giving it a richer colour. 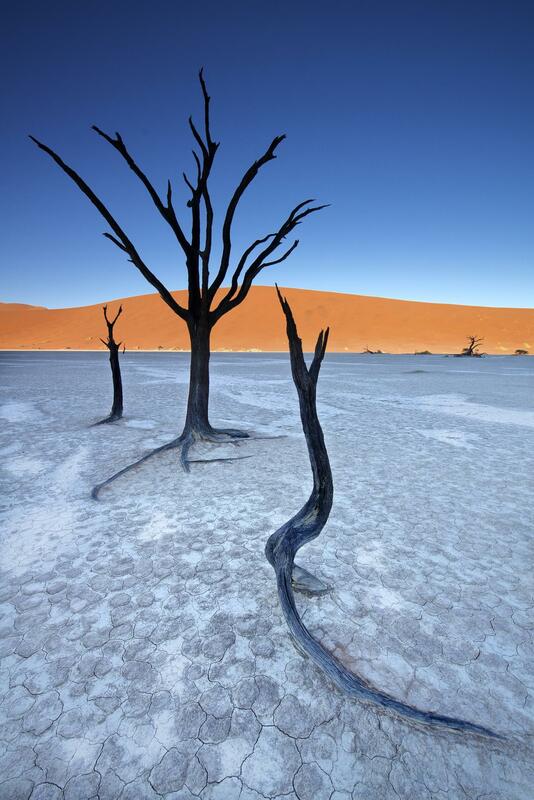 Deserts can lead to simplistic but effective images. A good example is this shot by Asa Pollendine where we see that the image has been taken from the bottom of the dune allowing the mountain of sand to act as a powerful foreground. The shot also allows for a good amount of sky to enter the frame giving us an image of two halves. Leading lines will be the most apparent compositional technique that leaps out at you. The wind of the desert has a habit of arranging the location into a series of flowing lines and shapes which you can use as a guide when composing your shot. In this shot by Wim Solheim our eye is led from right to left and back again in a z-shape that is repeated throughout the image. Our eye is carried comfortably from the foreground, to the middle-ground and then right to the background where we meet the blinding light of the sun in top left. The sand of the desert is a canvas that changes every second, so no two shots taken in the same location will be the same. The gentle winds of the desert often create zebra-striped patterns in the dust of the sand, giving the photographer plenty of visual interest in what can sometimes be a monotonous and uniform location. Shooting in black & white, as we can see in the shot below, helps to emphasise these strange natural patterns. 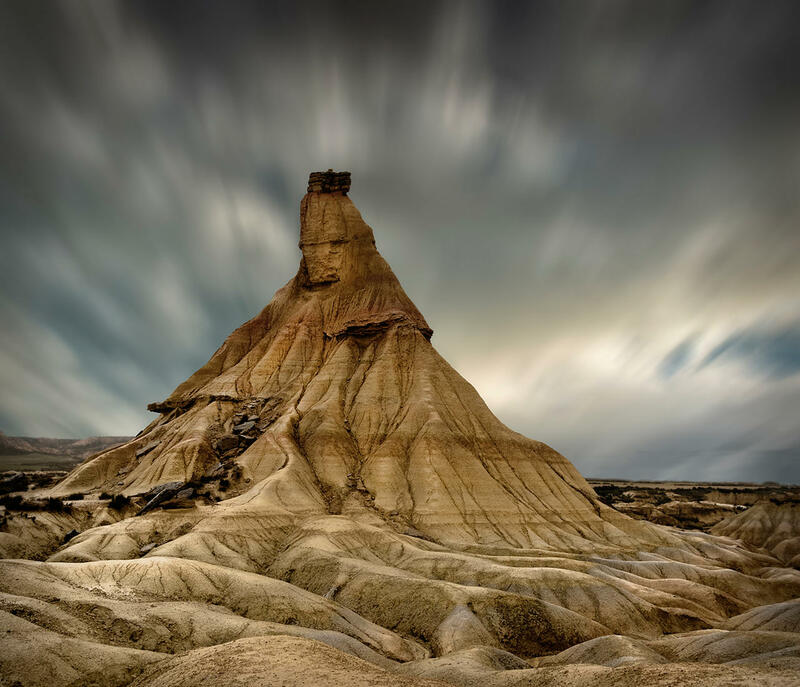 You can also find excellent patterns on rocks, eroding hillsides and in the dried and cracked patterns of clay-bearing soil caused by water evaporation. It can be difficult to communicate the scale of a desert. If you’re travelling in a party then you can use people to show the scale of the surroundings. If you’re travelling alone, however, there is every chance you’ll encounter people native to the land or even some of the wildlife that lives there. 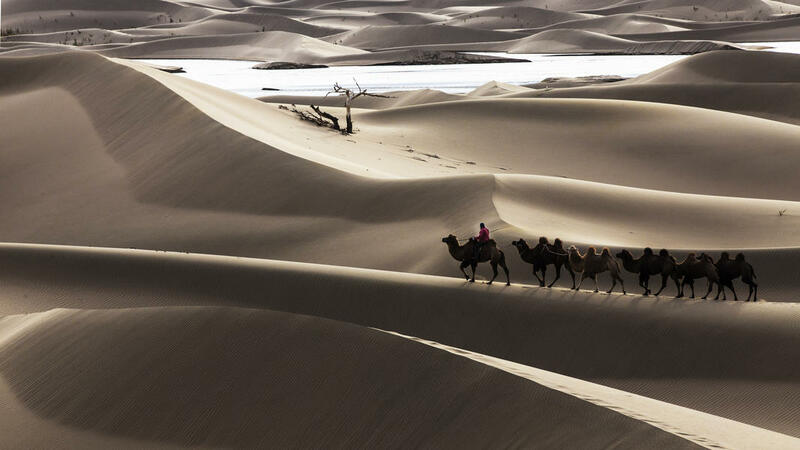 Deserts are surprisingly full of life so you’re unlikely to be stuck for a subject to use. Deserts are also home to a variety of flora such as cacti, and placing one of these somewhere in your composition is a more than effective means of showing off the scale of your location. With the vastness of the desert, it would seem obvious to use a wideangle optic. But also remember the desert is a largely empty location. Using a wideangle lens will only serve to emphasise the dearth of elements of the locations. It will spread out the dunes and potentially leave you with an image that lacks any real visual interest or anchor. 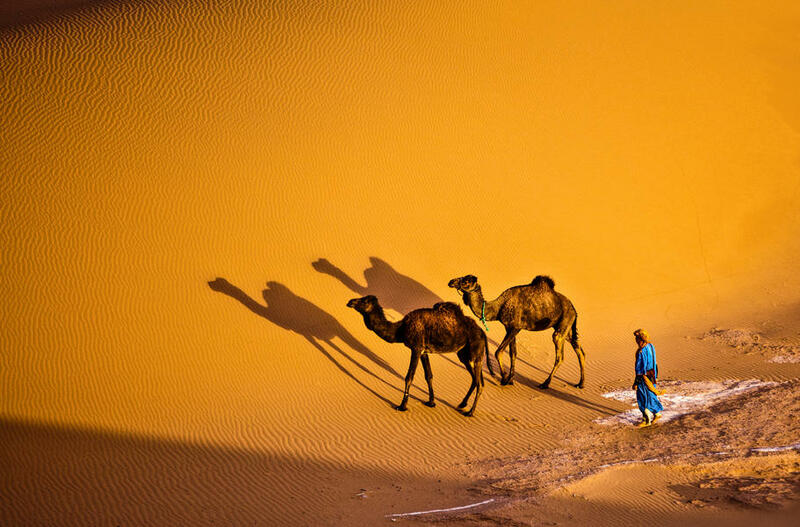 Using a telephoto lens, on the other hand, will help you to home in on the details of the desert. The contours and forms of the hills will become more dominant within the frame and the lens will also compress the scene to bring everything together as one complex and aesthetically pleasing composition. There’s no right or wrong way to set your exposure for the desert. As the desert is often bathed in gorgeous bright light you should be able to keep your setting fairly simple. You can keep your ISO low and your aperture somewhere around f/11 to ensure sharpness throughout the majority of the image. In many instances, you can rely on aperture priority or go fully manual. If the location happens to be subject to strong winds at the time of your shooting, then it’s worth experimenting with slow shutter speeds to capture the moving clouds sweeping over the location as we see in this shot. While the desert is a location of vivid reds and oranges, it can sometimes be beneficial to consider what the location will look like in black & white. Deserts are largely abstract landscapes so removing the colour can be a good way of revealing the unusual contours of the desert. Mohammadreza Momeni’s image is a perfect example. 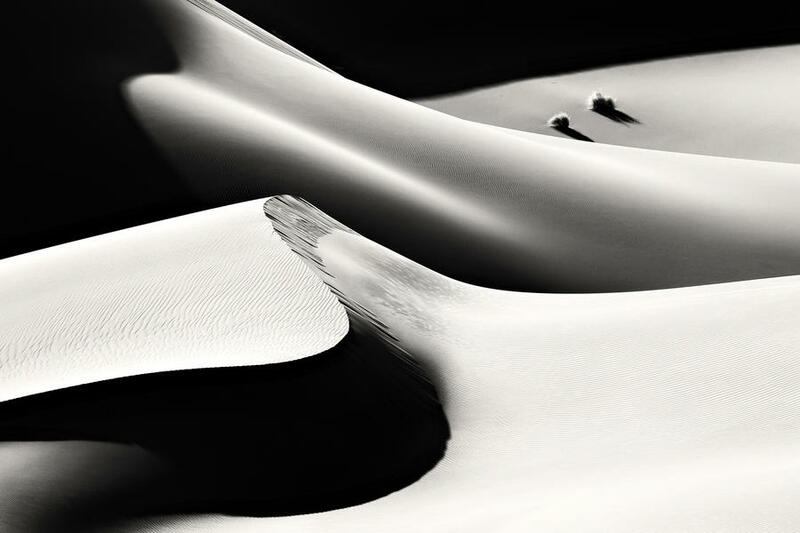 It’s a gorgeous image that reveals the stark contrasts of light and reveals the sensual sweeping forms of the dunes. 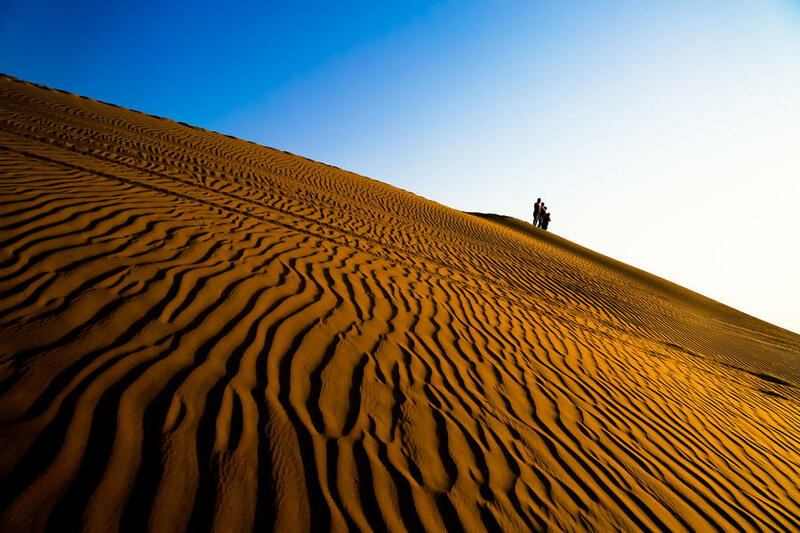 Sand and dust can play havoc with your camera and lens. It’s a good idea to attach a UV filter to your optic in order to shield it from scratches. You should also consider a lens hood in order to shield your lens from the sun and reduce the risk of lens flare. Keep a camera bag with you at all times and store your camera in your bag when you’re not using it. You should also carry a binbag or carrier bag with you to lay on the ground if you put your camera down. This will help prevent sand getting into the nooks and crannies of your gear. The desert is an unforgiving place so it’s of paramount importance you act sensibly and keep yourself protected. 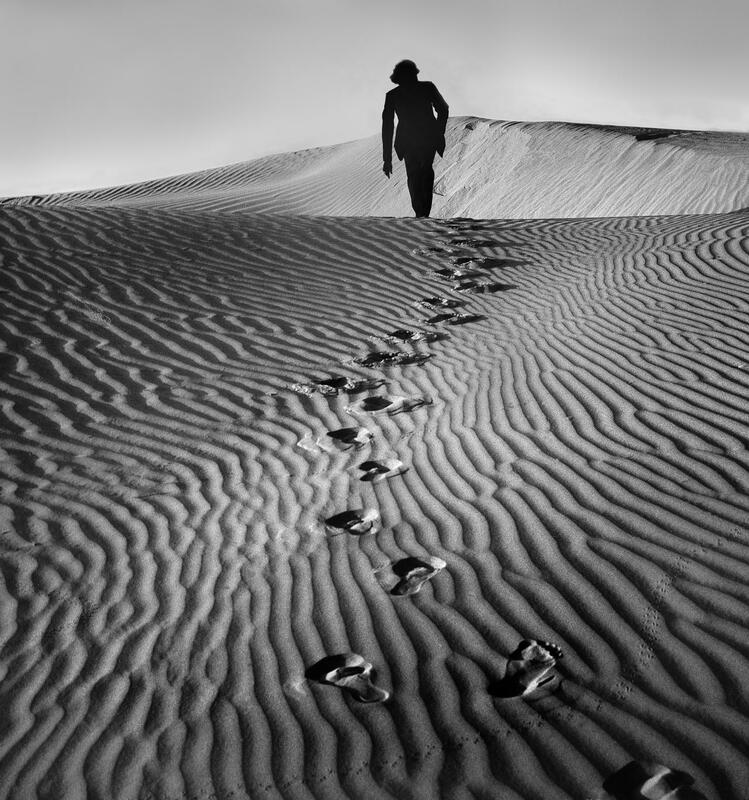 There have been far too many horror stories of people becoming lost or injured in the desert. Anyone who has seen Danny Boyle’s film ‘127 Hours’ will likely have its most famous image burned into their mind. 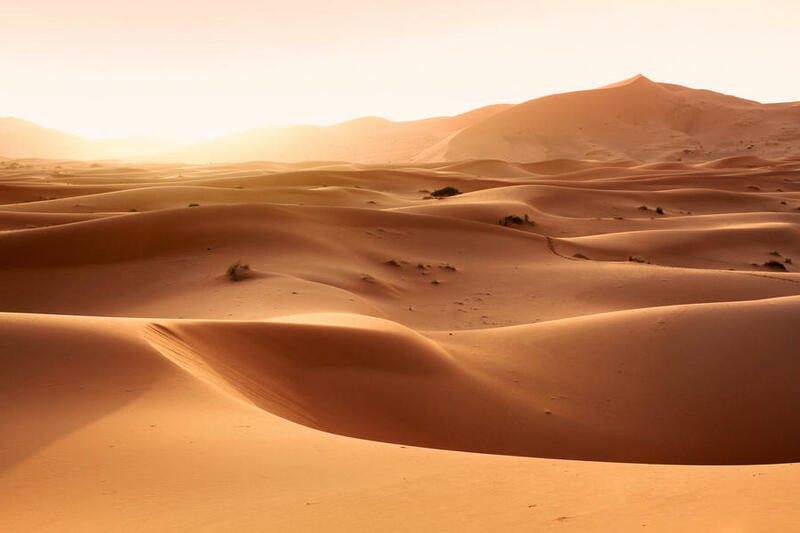 If you’re thinking of venturing out into the desert, make sure you let friends or family know your exact journey plan and, if you can, consult the local authorities so they are aware of the areas you intend to visit and when you intend to return. If you then fail to check in at a specified time, they will know exactly where to look. Let us know some of your favourite desert locations to visit and some of the tips you've picked up along the way in the comments below.